Already listed with our Phuket bungy jumping directory? 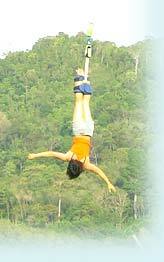 Phuket gives a change of extremely bungee jumping or the adventure in the air from the highest level dive to the lower. Bungee jumping in Phuket with more experiences in your lifetime provided you in a list of Phuket bungee jumping in Phuketindex.com. Visit Patong Park and enjoy Bungy Jump, Mini-Bungy Jump, Bowling, Snooker, and Thai Boxing, for school and corporate events.